In news that will delight Franklin Avenue's foodies, the fan-dam-tastic Mexican restaurateurs of Chavella's have inked a deal to take over the space at the northwest corner of Franklin and Sterling, formerly the J&B Deli Restaurant. Sure, it's only a few blocks from their current place, but I have no doubt whatsoever that their new franchise will do a thriving business. 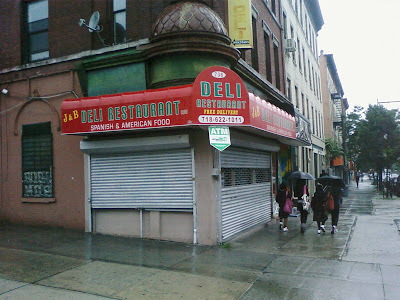 I'm also hearing through the grapevine that we may be getting a Middle Eastern place on the Avenue in one of the vacant storefronts between Eastern and Park sometime soon. More to come on that. That is great news! While it's now a whole BLOCK further from me....it will be big enough to eat in and not feel cramped and like a creepy eavesdropper! Also, I heard the same little story about Middle Eastern opening and the source confirmed. I can't wait! Absolutely fantastic!!!! !Great food, nice people, and clearly committed to the neighborhood. Such great news! I wish them much luck with the transition. Are they moving or just opening up a second restaurant? I was about to ask what "Anonymous 10:15am" asked... is this a new/different restaurant or are they moving to a bigger spot? I spoke to a waiter at Chevella's tonight. They are opening a new, different restaurant on Franklin, and keeping their current location. This is the kind of businesses we need in the neighborhood. I wish them all the best and I hope to see many more like them opening in the near future. This is the best way to improve our area and to throw out all those troublemakers. Great!!! Middle Eastern food is my favorite. Can't wait! When Carlos uses the word, "troublemakers," I suspect he means the poor people who live in the neighborhood. Chavella's is on the pricey side for this 'hood. I hate to see these kind of comments. If you want to live in a middle-class neighborhood, then don't move here. If you decide to move here, show some respect. Chavella's is pricey? I think a quarter chicken, rice and beans for $9 is a pretty good deal and is about what I paid when I lived in Sunset Park. In general, it's no more expensive than any of the other restaurants on Franklin. I hate to be a hater, but I LOVE J & B. I wonder if any of those posting here have ever even been inside. It's certainly a bit of an exclusive environment and somewhat intimidating if you don't speak Spanish, but the people there are truly warm and authentic souls of Franklin Avenue. If this news is true and J & B is being bought out, then I will miss partying late into the night to Colombian music with Javier & company. And why, exactly, is every one excited for a duplicate restaurant one block away? A "new, different" restaurant, could be interesting. But prior to that description of the new restaurant, I didn't understand everyone's enthusiasm for a place to catch Chavella's runoff. I thought the folks living on Franklin would understand this 'nabe a bit better than that. Anyway, I guess this lonely post won't undo the ink on this deal. R.I.P. J & B.